Many of us will be looking ahead to the long Easter weekend this week, with family get togethers and great food in the pipeline! If you’re hosting, we’ve got some top tips and tricks for a delicious lamb roast – the perfect meal for big numbers. 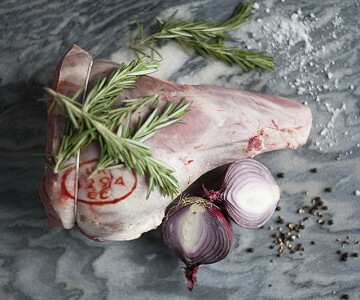 Lamb has long been a traditional meal for Easter Sunday, and has roots in early Passover observances. In the past too, lambs tended to be the most readily available livestock after a long winter with meat stocks running low, which is one of the reasons for it being the meat of choice in spring. Take the lamb from the fridge around one hour before you plan on cooking – this will allow it to come to room temperature. Make incisions into the lamb meat – this will allow any rub/spices to soak into the meat as it cooks. Garlic and rosemary work well! Get your timings right – for a whole leg, cook at 150° fan for 40 minutes per 500g, plus 40 minutes. For a half leg, cook at 160° fan for 25 minutes per 500g plus 25 minutes. Leave the roast to rest once cooked for around 15-20 minutes. Finally, slice the meat against the grain to get the most tender slices! Remember to confirm your Best of Local orders by 5pm on Thursday in time for Good Friday! If you need a delivery to your door on Saturday, please order by 5pm Friday. You can browse our Easter range here.